A very cool LEGO MINDSTORMS NXT project from Tufts University. A student has put together a prototype musical instrument shield. The project uses the LEGO MINDSTORMS NXT to control a custom board (shown to the right) that generates really fantastic music! The project allows users to make portable musical instruments with the NXT that plays midi sounds. The video below shows the board making music with three NXT touch buttons and a motor. The video is a demonstration of the board and shows one possible design using NXT sensors. 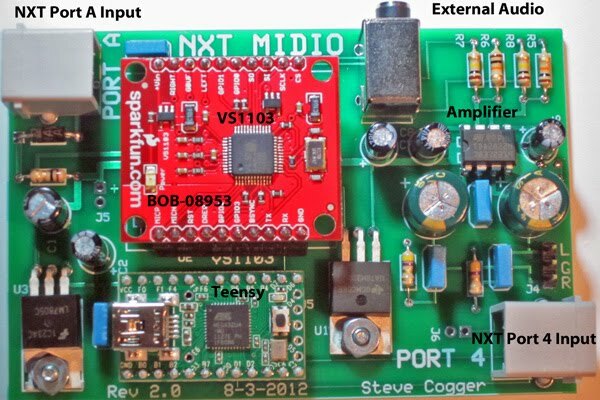 The NXT motors are used as rotation encoders to select the MIDI note velocity (volume) and the octave. The touch sensors trigger the note selection. The middle octave starts at MIDI note 60. The NXT software allows selection of a scale above and below the scale starting at note 60. The MIDI Channel (instrument sound) is set with the left and right front panel buttons on the NXT . . . The on-board amplifier powers a pair of speakers attached to the NXT. See the website, which has more information, schematics, and more pictures here: https://sites.google.com/site/nxtmidi/home.